A much-anticipated ruling on the South China Sea dispute initiated against China by the Philippines finally came down – and unsurprisingly, the Hague-based international tribunal that judged it ruled in favour of the Philippines, rejecting China’s claims of historical rights to the sea’s resources. The Philippines welcomed the ruling, and celebrated it as a devastating legal blow to China’s claims in the contested waters. Filipinos coined a new word, “Chexit”, inspired by the term Brexit, to symbolise that China is out of the South China Sea. The reaction from China was furious. Its Ministry of Foreign Affairs immediatelydeclaredthat “the award is null and has no binding force”, and that China “neither accepts nor recognises it”. Xinhua, the state news agency, said the tribunal was “law-abusing” and its award “ill-founded”. Meanwhile Beijing released a white paper reiterating its claims to the South China Sea and adhering to the position that the dispute should be settled through negotiations. Chinese internet users overwhelmingly expressed their patriotic sentiments and support for the government claim. On Sina Weibo, China’s hugely popular social sharing site, state newspaper People’s Daily said “there is no need for others to rule on China’s territorial and maritime rights”, with an image and slogan stating, “China: we can’t lose even one single dot”. Within a few hours, this message had attracted more than 1m retweets and hundreds of thousands of supporters among Weibo users. Its hashtag has totted up more than 3.7 billion shares. In the global media, by contrast, China has been widely accused of disregarding international law and needlessly heating up the dispute in the region. In what still thankfully remains a war of words, at least for now, it may be worth looking into the reasons why China rejects the authority of international arbitration in the first place. Right after the Philippines appealed to the court in 2013, Beijing stated that it would not participate in the tribunal proceedings because the Philippines had no legal grounds to unilaterally initiate compulsory arbitration. And in December 2014, the Chinese Ministry of Foreign Affairs released an official position paper stating that it would neither recognise nor participate in the arbitration. Its argument was that the UN Convention on the Law of Sea cannot be used to decide issues of sovereignty in the South China Sea. It also pointed to an official declaration of optional exception that China made in 2006, which stated that China accepted no compulsory settlement procedures provided by the convention on territorial sovereignty and maritime delimitation. Beijing takes the position that the South China Sea dispute should be resolved firstly by negotiations among the countries involved before any international arbitration takes place. Under the UN convention, compulsory arbitration can only be sought after other procedures, including bilateral negotiations, have been exhausted – something China does not believe has happened yet. China is under severe criticism for its position. The US in particular has long urged China to respect international law; back in December 2014, the US State Department released a report subjecting China’s claims to legal scrutiny. And since 2015, in the name of “freedom of navigation exercises”, the US Navy has deployed more and more military patrol warships near the contested waters, despite the fact that it is not a party to the territorial claims in the disputed waters. From the perspective of hawkish US politicians, China has a choice. As senior members of the Senate Armed Services committee put it: “China can choose to be guided by international law, institutions, and norms. Or it can choose to reject them and pursue the path of intimidation and coercion”. 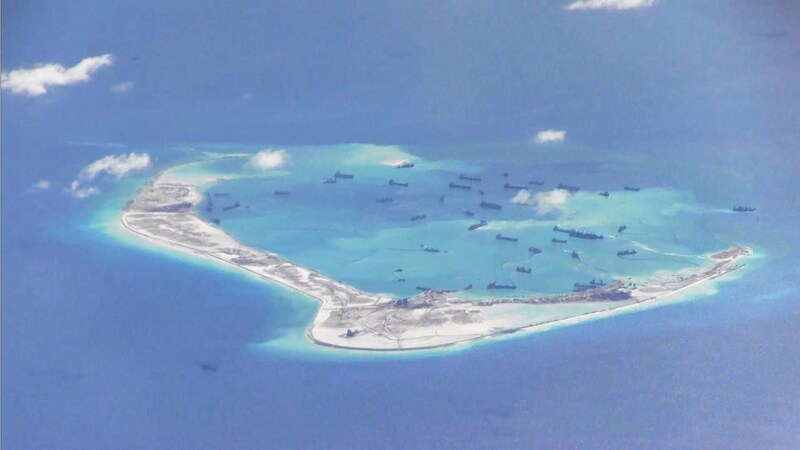 Nonetheless, confronted by all these criticisms and warnings, the Chinese government has vowed to take all necessary measures to defend its territorial claims. Prior to the ruling, when presenting at the China-US dialogue on the South China Sea, Dai Bingguo, a former state councillor, made the remark that the ruling is “nothing but a piece of paper”, and China would not be intimidated even if the US sent ten aircraft carriers to the disputed waters. In China, the US has been widely regarded as the principal supporter of the arbitration case, since Washington sees the South China Sea issue as a critical part of its much-vaunted “pivot to Asia. Scholars in China pointed out the West’s double standards, raising the cases of the UK-controlled Chagos Islands and a case involving the US in Nicaragua. Liu Haiyang, a researcher at the South China Sea Research Centre at Nanjing University, claimed that the US had been deliberately muddling the concepts governing the debate in an international media campaign. He regards the arbitration as “American political trickery” in the name of law. In a recent article about the UK’s Chilcot Report on the Iraq War he even made a reference to what was happening in Asia-Pacific, implicating the US as a troublemaker in the region. This year, the contested waters have seen an uptick in US military activities, and just the day before the ruling came down, China had just finished a week-long military drill. This was unsettling enough in itself, but the situation post-ruling will be even more worrying. As China continues its rise towards superpower status, it’s only becoming more assertive in defending its core interests and more confrontational in its foreign relations. As Beijing sees it, the South China Sea is a crucial arena for defending core national interests, including state sovereignty, territorial integrity, and national security – all crucial to the Chinese Communist Party’s domestic political legitimacy. This leaves it little room to back down, and as a result, naval and military forces of all kinds are rapidly convening in a hotly contested area. And while a full-blown conflict may not be imminent, this is not something to be complacent about. So what’s to be done? Paul Gewirtz, the director of Yale Law School’s China Centre, has looked into the limits of law in the South China Sea. He argued that although a rules-based and law-based approach is an admirable aspiration, it cannot solve the dangerous problem in the region. He suggested that the most realistic path forward would be bilateral and multilateral negotiations. The dangers in the South China Sea must not be underestimated, and misconceptions and misjudgements still abound. This latest case may be over, but the dispute at its core is far from settled. Jing Cheng is a Doctoral Researcher at the School of Politics and International Relations at the University of Nottingham. This article was first published on The Conversation and can be found here. Image credit: Screencap/Youtube.